Today, we’re excited to announce a new Speakap feature, Multiple Themes, helping companies with several brands and/or locations personalize the employee experience and differentiate their platform for their employees, enabling them to work in an environment that feels familiar to them. 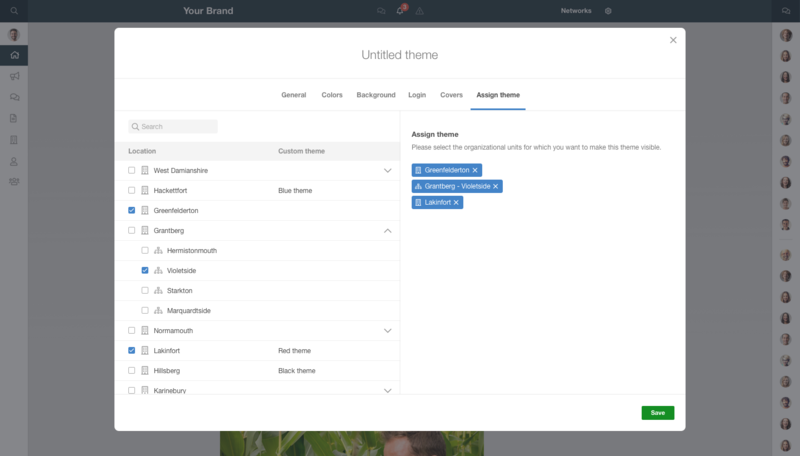 Here’s a quick rundown of what the Multiple Themes feature looks like in practice, and how to set it up for your employees. At Speakap, we’ve been working with customers, who as a single conglomerate manage multiple brands, along with umbrella brands with multiple localized brands, and single brands localizing their marketing campaigns in different countries. With Speakap platform, you can brand your network in your own corporate branding, which makes it recognizable and feels safe for you and your employees. However, if you have, like our mentioned customers, multiple brands within your company, or if you operate in different markets with different branding in each market, a single theme may not be sufficient. That’s because users of a company under the parent company may not be aware or familiar with the parent company and its branding. 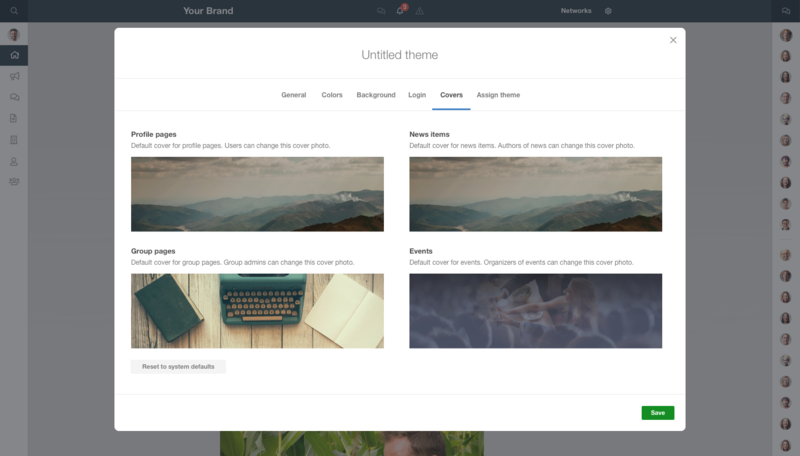 We released the Multiple Themes feature to make sure all users can work and communicate in an environment they recognize and relate to, and one that feels trustworthy. 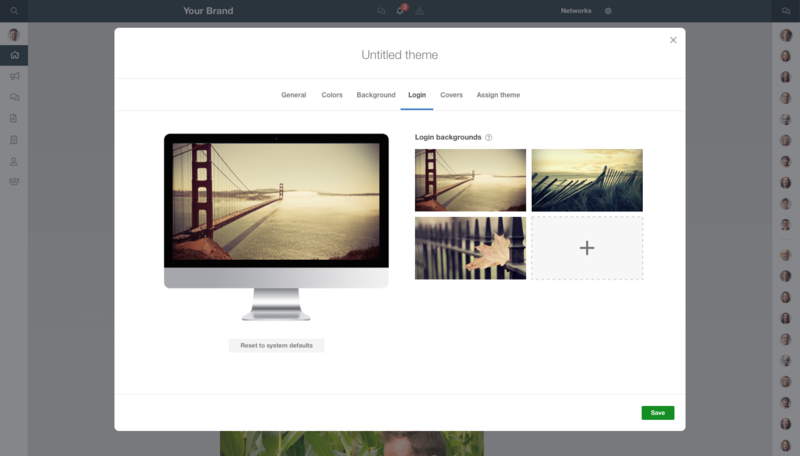 We now offer the option to create multiple themes within your network. You can assign them to individual Business Units and Local Departments. Members of these Business Units and Local Departments will see their network in the branding that feels familiar and safe to them. We learned about this need from our customers, for whom a single theme was no longer enough (more about that later). If you, too, need to create multiple themes within your network, assign a theme to one or multiple groups of users, use a default theme for the entire network, apply correct theme when user logs into your network, or prevent and/or handle conflicting theme assignments, the Multiple Themes feature is for you. 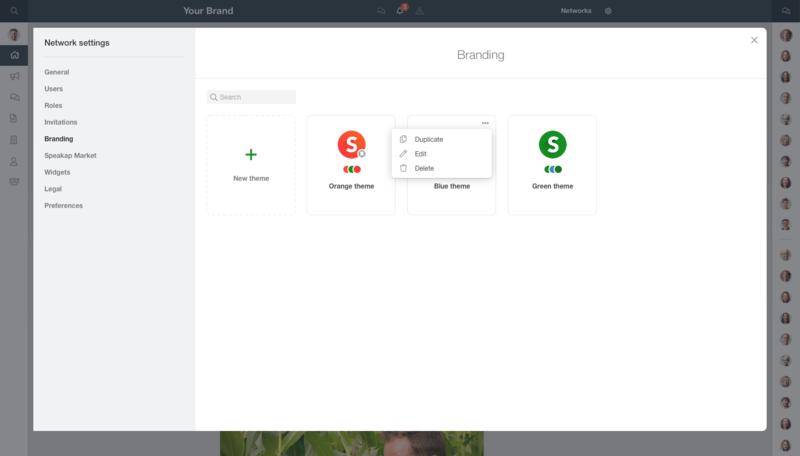 In the Branding section of your Network settings, you’ve been already able to change the colors, favicon, backgrounds and logos of your network. 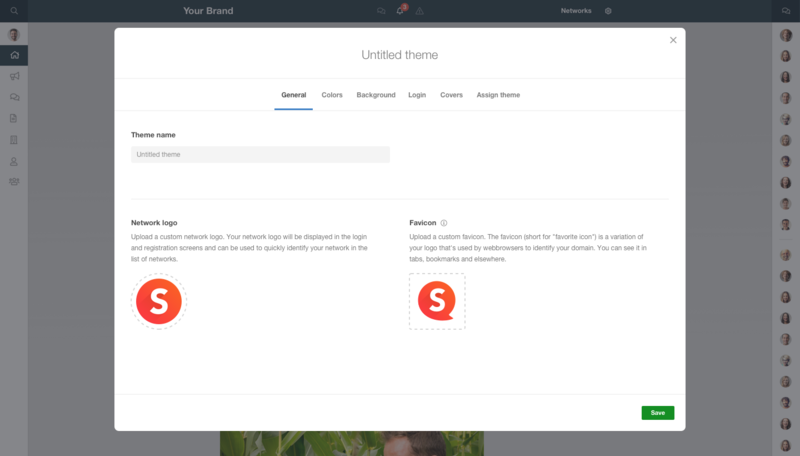 You can now create new themes, search for the themes within your network and edit or manage your existing themes, to brand your network with your own logos, colors and backgrounds, all to provide a more personalized experience to your employees. Now you can set a theme name, add a network logo that your employees will see upon logging in, as well as your unique favicon (shown in tabs, bookmarks and elsewhere) with the General tab. The Colors tab, lets you change the header, buttons and links’ color throughout the platform, with the option to always reset your custom settings to default Speakap colors. This way, your employees will experience Speakap in the appropriate and familiar branding. For an extra touch of personalization, set a background image for your network (default image or your own) with the Background tab. Also a “Reset to system defaults” option lets you set the background back to the default, gray color. 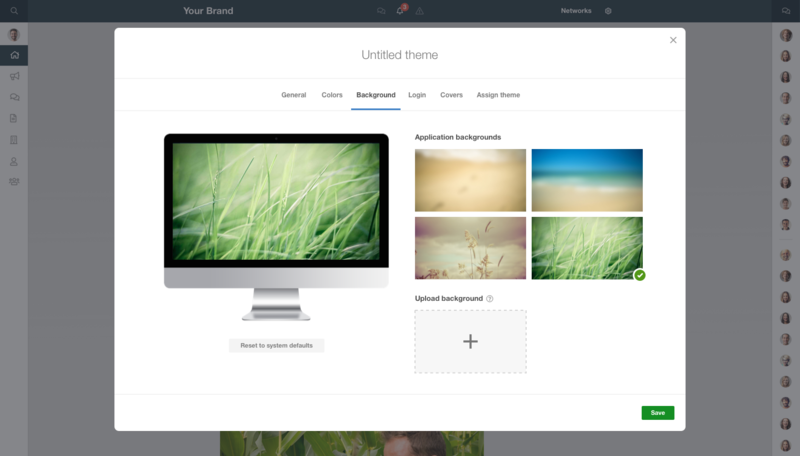 To create a more customized background on your logon page, the Login tab allows you to either keep the default login backgrounds, or upload four custom backgrounds. It can be always reset to default settings. You can also upload a default cover image in the Covers tab. It will be applied to a group, profile, news item or event if no custom cover image has been provided for that specific item, and can be always reset. This is a value add in your employee experience of the platform and your brand. If you want to assign your theme to one or multiple organizational groups within your network, use the Assign theme tab. This way, each member of a group that has a theme assigned to it, will see your Speakap network in that specific theme. For each theme within your network, an administrator with access to this section can duplicate, edit and delete any theme. Seamlessly, with no manual work. The Multiple Themes feature came to exist because we get into our customers’ shoes daily. Speakap has been attracting a new breed of customers, the so-called umbrella companies with multiple brands, and well-known brands with multiple localized entities. For them a single theme is no longer sufficient, as employees of different brands, or employees located in different countries are sometimes completely unfamiliar with the mother company, its name, and/or branding. For them, logging into Speakap felt like walking into an unknown territory: distant and foreign. 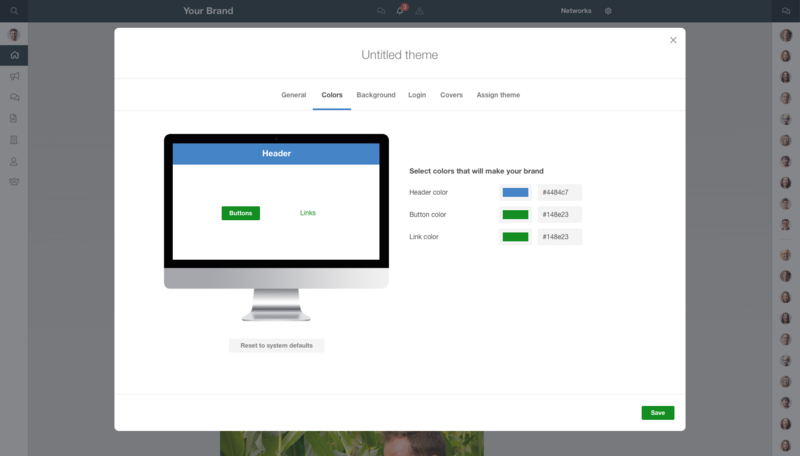 Once the Multiple Theme feature was implemented, our beta customers noticed a spike in employee logins and engagement levels. The platform finally became a familiar place for communication. We think you’ll love these enhancements to your Speakap platform and what they mean for your employees’ sense of trust and belonging with one of your brands and/or locations. These are just a few of the many new capabilities that are on the way. We believe Speakap should be a foundational tool for your internal communications transformation. And we’re just getting started! Start boosting your employee engagement with Speakap today!